NJ Transit supports and encourages bicycle access to its terminals, facilities and services by providing accommodations for customers using bicycles to the greatest extent possible. There is no extra charge for bicycles brought aboard NJ Transit vehicles, access is allowed from all station platforms, and permits are not required. Collapsible bicycles are allowed on all NJ TRANSIT trains at all times. Standard frame bicycles are permitted on many trains under certain conditions. 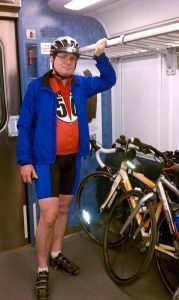 For additional information, please visit the Bicycles on Board NJ Transit trains web page.